My son has recently turned 5 and he asked for a birthday cake fully made of chocolate, with Dinosaur Train on it and decorated with cherries. And two days ago, after school, he suddenly said “Mom, let’s bake a chocolate cake! Call Joanna (our friend that made the birthday cake) and ask her the recipe!”. I would have loved to comply, but first of all, that cake is not easy to make, so I wouldn’t even try, and second, I didn’t want to ask anyone for the secret recipe of a great cake. 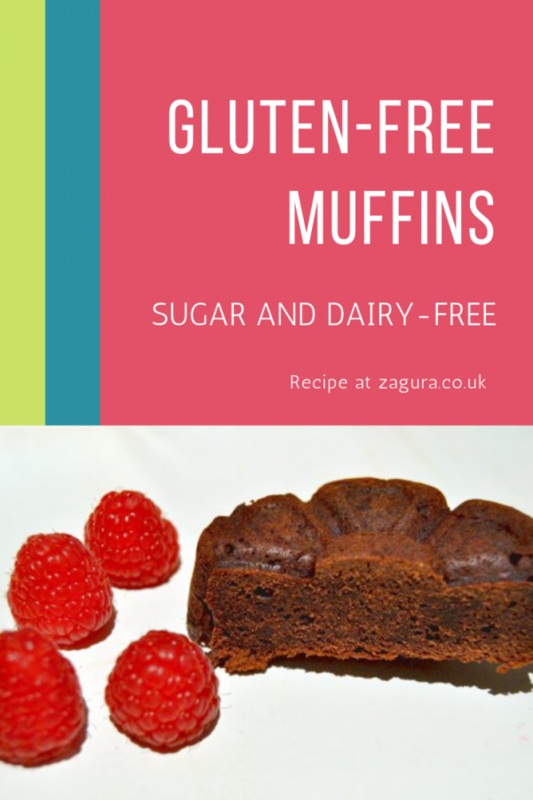 Still, my son was very determined to eat a chocolate cake, so I took out the “Gluten-free 101” book by Carol Fenster and looked for a suitable recipe, checking also that we had all the needed ingredients in the kitchen. And we decided to bake some chocolate brownies, adapting the recipe in order to make it sugar-free and dairy-free. The recipe is simple, the baking time is 20 minutes and the taste is great, these fudgy and chewy brownies go well with milk or coffee or on their own. 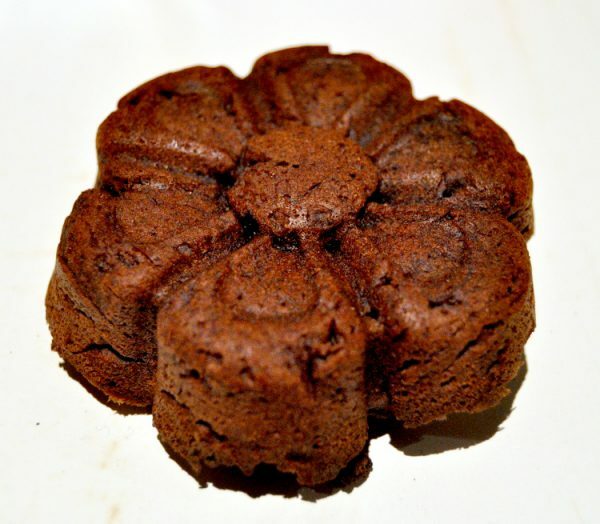 The recipe is below, the photos taken are of the last brownie from the first batch, and if you bake some, come back and tell me how you liked them! In a small bowl, whisk together the first 5 ingredients (flour, cocoa, baking powder, salt and xanthan gum). In a large bowl, beat the oil and xylitol with an electric mixer until well combined, then add the egg and vanilla and mix again. With the mixer on low speed, add the flour blend mixture to the egg mixture, then add the warm water, beating until smooth. Divide the batter in muffin cases (or pour it in a 8-inch square baking pan) and bake for 20 minutes. I’ve never used xanthan gum before. If I can’t get some, can I omit? Or is there an alternative? Xanthan gum is a binder, needed to replace gluten, and yes, there are other alternatives like cornstarch and arrowroot (replacing 1:1) or a mixture of one tablespoon of chia seeds to three tablespoons of water to replace one tablespoon of xanthan gum. Never tried to replace it yet though. I will definitely try these, they sound ideal for my eating requirements. Have also pinned your post.